What is Your “Target Audience” in Marketing? Editor’s Note: This is the latest in a series of stories concerning the ongoing competition for the Western Mass. casino license. Mike Mathis says the phrase ‘inside-out casino’ wouldn’t technically be considered an industry term within the gaming sector, although he believes it’s close to becoming an important part of the lexicon, especially in the context of the competition for the Western Mass. casino license. ‘Inside-out’ is an adjective being used liberally by officials at MGM Resorts International, including Mathis, who serves as vice president of Global Gaming Development, to describe the company’s $800 million proposal for Springfield’s South End. It is being used interchangeably with ‘outward-facing’ to describe what this proposed resort complex is — as well as how it differentiates itself from most urban gaming facilities, as well as the other players in the contest for the 413 area code’s casino license. “This is really about changing and evolving the model of the casino box,” Mathis explained, adding that this concept is quite unique for an urban gaming complex. “In the traditional model, there are a couple of points of entry, with the operation heavily driven by gaming, with the few amenities being offered sort of buried within the facility, forcing the traffic through the casinos to get to those amenities. In this respect, the Springfield proposal is much like some of the so-called ‘neighborhood casinos’ in Las Vegas that are especially popular with families, he noted, and also like MGM’s ambitious City Center, its flagship property in Vegas. Opened in late 2009, at the height of the recession, the center boasts a combination of retail, entertainment, convention facilities, and residential units, and is thus a truly mixed-use facility, he explained, adding that, while the scale will be exponentially smaller with MGM Springfield, the concept is essentially the same. And it will represent a meaningful change from the approach taken with most all urban casinos. 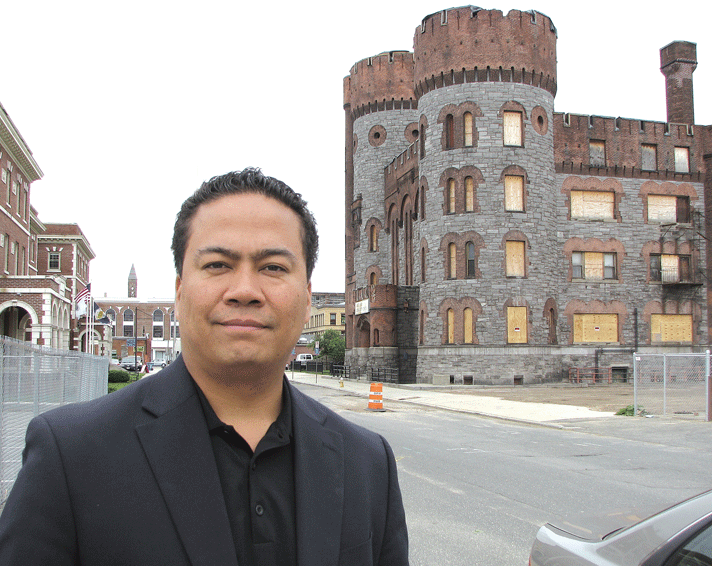 Elaborating, Mathis said most inner-city gaming complexes end up becoming islands unto themselves, with little connectivity to the neighborhoods around them. The inside-out model is different, he went on, adding that, with this design, restaurants and other amenities such as a bowling alley, theaters, a skating rink, and others, face out to the community surrounding the gaming complex. This makes such facilities more attractive to families and adults who don’t gamble. Top, Mike Mathis, seen near the tornado-damaged South End Community Center, says MGM’s conception of an inside-out casino is unique for an urban gaming facility. 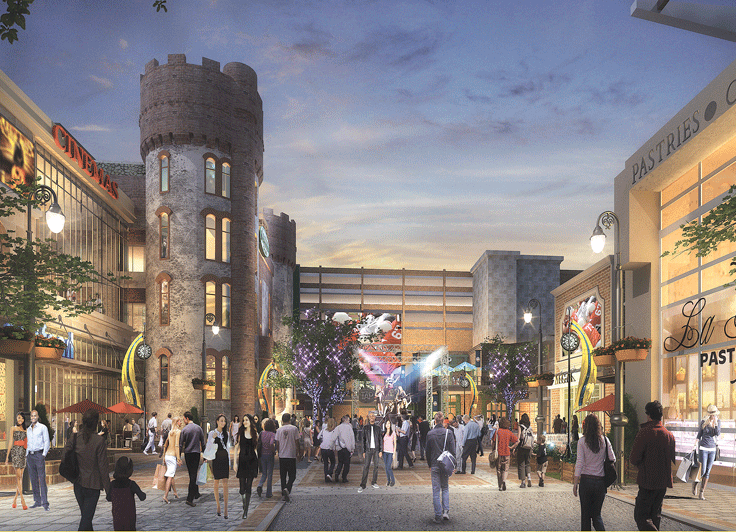 Above, an architect’s rendering of that same area as transformed by MGM Springfield. Mathis and others at MGM believe this inside-out design will give the company an edge in the ongoing competition for the Western Mass. license, because of its uniqueness, potential to generating revenue beyond the casino floor, and ability to address many of the concerns raised by the Legislature when it passed a sweeping gaming measure in the fall of 2011 — especially those concerning impact on existing businesses and entertainment venues. 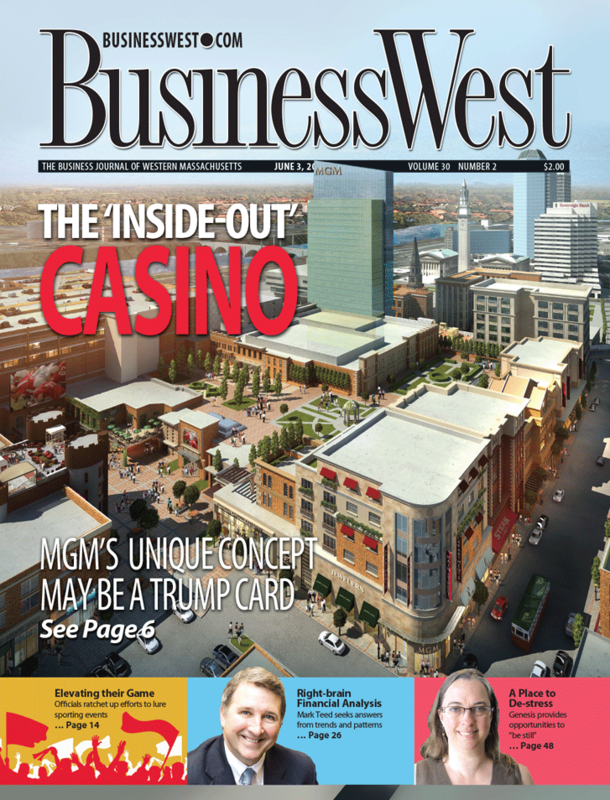 For this issue, BusinessWest continues its series of stories on the casino competition with a detailed look at this inside-out model, and why MGM believes this concept will give the company the equivalent of a trump card. Mathis told BusinessWest that he’s been involved in many aspects of the project known now as MGM Springfield, including the drafting of the host-community agreement that was inked just over a month ago. Early on, though, one of his primary responsibilities was to identify a site for the company’s foray into the Massachusetts market. Like other developers, MGM targeted the Western Mass. sector — it was considered a more open competition than those in the Boston and Southeast regions — and initially set its sights on rural Brimfield. But that plan was scuttled due to a number of logistical hurdles, not the least of which was the complex matter of building a new interchange on the Mass. Turnpike, without which the project didn’t make sound business sense. So the company recalibrated and eventually focused on Springfield, as other developers did, because of its proximity to Northern Conn., accessibility (especially from I-91), and the likelihood that a ballot initiative would pass in the city. And the search within the city eventually took the company to the four-block area in the South End, much of which was heavily damaged by the June 1, 2011 tornado. MGM officials say the inside-out concept will give the company an edge in the competition for the Western Mass. casino license. “There were a few key attributes to that site that really drove the decision,” he explained. “Its proximity to the MassMutual Center was important to us; the gaming legislation talks about having an operator supporting existing facilities and not cannibalizing or competing with existing entertainment facilities. Right across from the site is a state-owned, really wonderful entertainment venue that is, by all accounts, underperforming and undersupported. We thought this was a natural tie. Elaborating, he said the site provided MGM with an opportunity to do something unique, while also addressing many of the concerns of the Legislature when it drafted its gaming measure. And while much of the debate going forward will center on the ‘urban versus rural’ argument, with the Palmer and West Springfield proposals fitting the latter description, to one or extent or another, the inside-out casino concept forwarded by MGM takes those discussions to a different, higher level. That’s because most urban casinos become those islands that Mathis described, adding that the plan for MGM Springfield seeks to address shortcomings with the traditional urban model, as outlined by Las Vegas casino consultant Andrew Klebanow in recent comments to the Boston Globe. “We just haven’t seen it done right yet,” he told the Globe, in reference to the urban model, noting that, with few exceptions, these casinos are not connected to the neighborhoods around them, and casino patrons generally don’t get beyond the gaming complex. He cited Horseshoe Casino Cincinnati, which opened just three months ago, as a facility that could be considered different. Designed by Rock Gaming in partnership with Caesars Entertainment, it was built downtown and designed with restaurants on the outside, facing the streets, to encourage foot traffic. 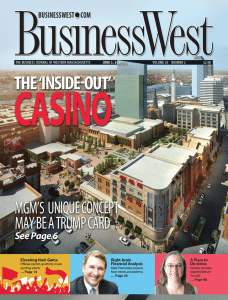 Mathis told BusinessWest that he has heard the phrase ‘inside-out’ used in reference to the Cincinnati casino, but he believes MGM Springfield will soon set a new standard when it comes to that term. 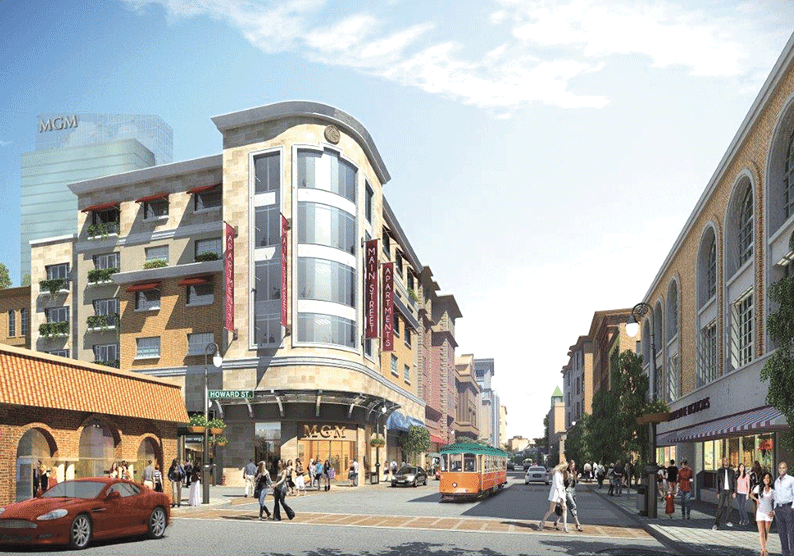 Another view of the planned MGM Springfield, looking down Main Street. 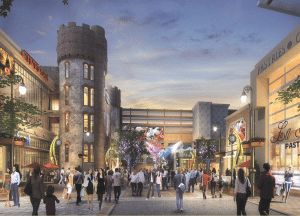 Indeed, as he walked the site with BusinessWest, Mathis noted that MGM Springfield will not only change the tornado-ravaged landscape, but create a facility that will be truly worthy of the word ‘resort,’ rather than casino. While walking back downtown from the South End, Mathis pointed to the marquee on the MassMutual Center, announcing the May 24 performance of hip-hop artist Pitbull as another example of how this outward-facing model will manifest itself. Connecting the casino with the community in such ways is a big part of the inside-out model, said Mathis, adding that, overall, this concept is designed to make the casino part of the neighborhood, not an island within it. And while the inside-out casino addresses concerns outlined in the gaming legislation, it also represents a sound business strategy for MGM, said Mathis, adding that this model creates more opportunities to attract families and individuals who have no interest in visiting the casino floor. “We’re going to bring in the outdoors,” he said. “Our restaurant spaces are designed to have outdoor plazas so people can enjoy the outdoor experience, we have a skating rink and free outdoor entertainment — and these amenities speak to how we’re trying to get visitation from families who aren’t interested in the casino. 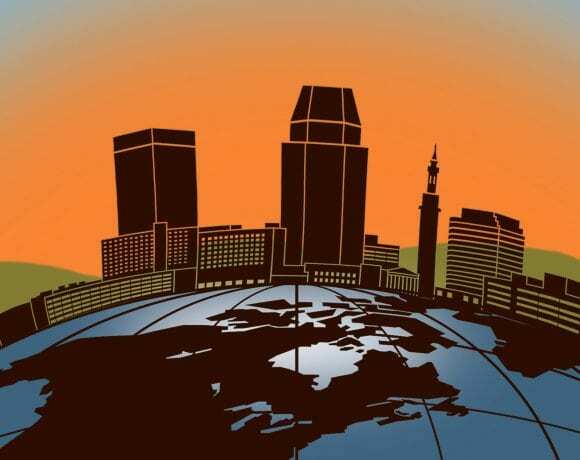 It will be difficult to generate that ratio in Springfield, he continued, because the scale of the project is much smaller than the company’s properties in Las Vegas, for example, which have 3,000 rooms and millions of square feet of convention space. But MGM Springfield can — and likely will — generate more revenue outside of the casino floor than a traditional urban gaming complex, he noted, because of this inside-out operational philosophy. 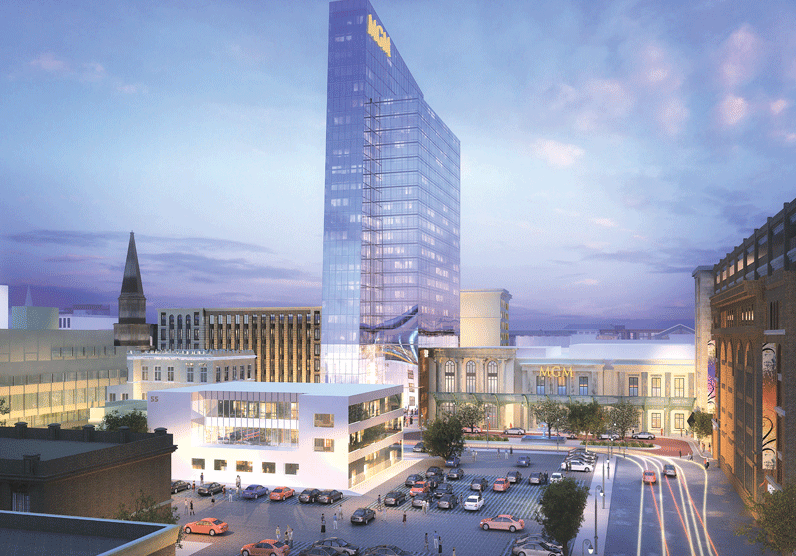 MGM’s Springfield proposal has many more hurdles to clear before it becomes reality. The next challenge is a July referendum vote that will include the entire city. If that goes successfully — and most predict that it will — then the company must prevail over whichever Western Mass. proposals also make it before the state Gaming Commission. But there is a quiet confidence among company officials, including Mathis, that the company is in a strong position to prevail, and the so-called ‘inside-out’ casino plan is one of the many reasons why. The concept represents a fundamental change from how urban casinos have been built, he explained, and it brings potential benefits for the state, the city, the South End neighborhood, and the company.